Hard at work releasing many of their classic titles on Blu Ray, Blue Underground is releasing their first new title in quite some time on June 28th - The Nesting. A little known horror film from 1981, this one is a welcome addition to Blue Underground's fantastic catalog and sure to be a hit among horror fans. I'll admit that I had never heard of this film before but when I saw the announcement for it, I instantly knew I had to get it. Robin Groves plays mystery author Lauren Cochran, who suffers from Agoraphobia. After suffering from a panic attack on a crowded street, she decides to go out into the country to try to write her next book. She accidentally stumbles upon an old mansion that looks exactly like the one she had visions of and used for the cover of her last book. She meets some of the locals, including Colonel Lebrun (John Carradine) who has what seems like a stroke after getting some bad vibes off of Lauren. While staying in the old mansion, Lauren starts having visions of awful things that have happened there. Soon enough, more awful things start happening to those around her and it seems like the house itself is causing these deaths. 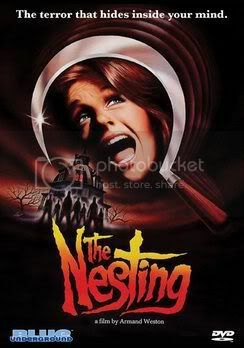 The Nesting was a neat little forgotten gem from one of my favorite periods of horror. The film is a blend of not only the haunted house films of the 70s (Legend of Hell House, The Changeling) but also on the recent 80s slasher craze. There are some nasty deaths in this film (that I won't give away) which should please any gorehound. The strongest aspect of the film however is definitely the use of atmosphere. The old mansion is used perfectly as a creepy haven for supernatural occurrences and the visions Lauren has are quite scary. The film lost some steam in the second half but it is well worth a watch, especially for those who love haunted house movies or atmospheric horror. Blue Underground is releasing The Nesting on both DVD and Blu Ray. The copy I watched was DVD and I must say that for a 30 year old film, I don't think I have ever seen a more beautiful transfer. The film elements must have been kept in pristine condition because it is hard to believe just how good it turned out. The picture is crystal clear and the sound is also very crisp (and loud at just the right moments). Also included is a series of deleted and extended scenes, as well as trailers, tv spots and a poster & still gallery. For such an obscure film, Blue Underground has gone above and beyond to deliver such an incredible release. Hopefully they continue releasing more interesting new titles like this. The Nesting is available for pre-order on DVD and BLU RAY direct from Blue Underground.